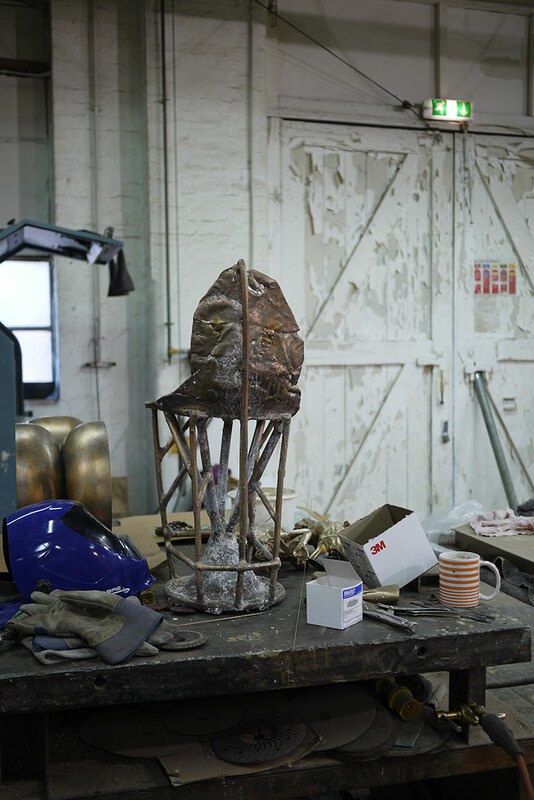 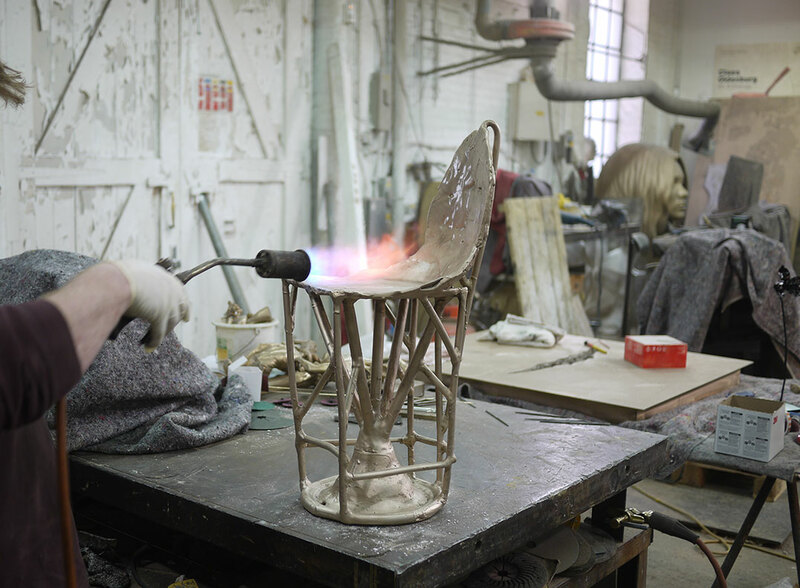 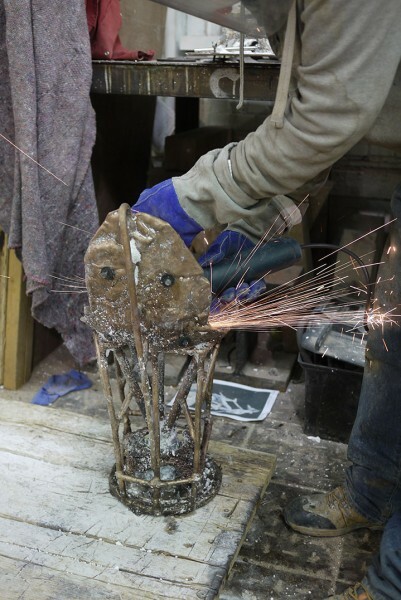 The idea for this project began in 2007 on my first visit to AB Fine Art Foundry in East London to see the prototype of my Poly Bronze Stool. 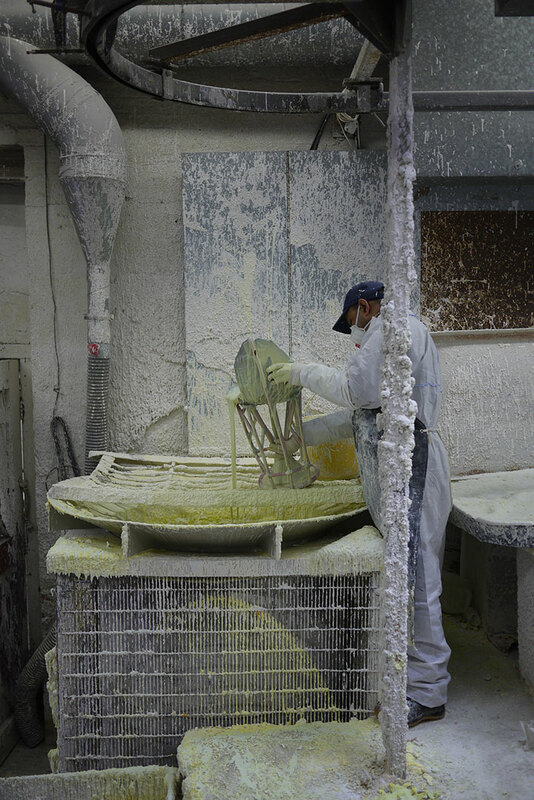 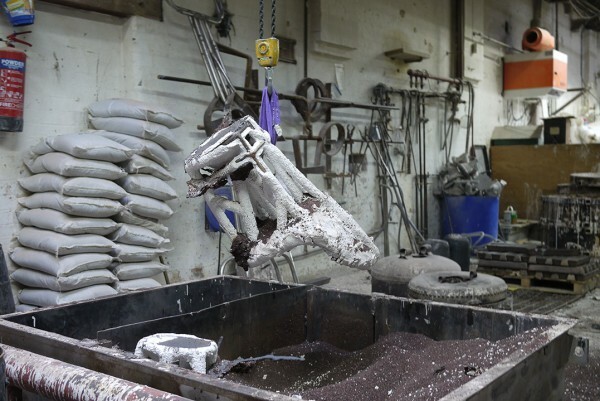 I received a full tour of the foundry and saw all of the processes from moulding, pattern-making, waxing, spruing, ceramic shelling, pre-firing, de-waxing, casting, de-shelling, welding, fettling and chasing, sandblasting, polishing, patinating, renaissance waxing and finally buffing. 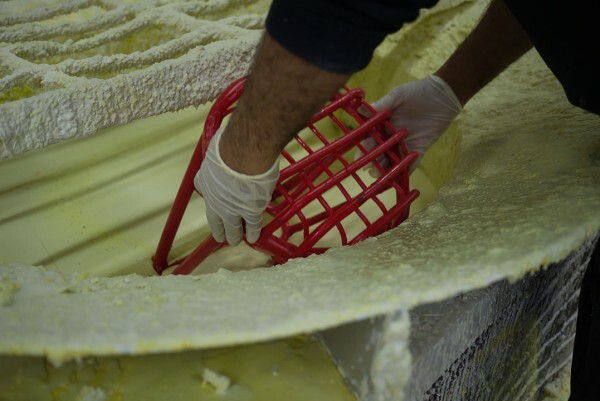 Every process requires years of knowledge, practiced skill, patience and time. 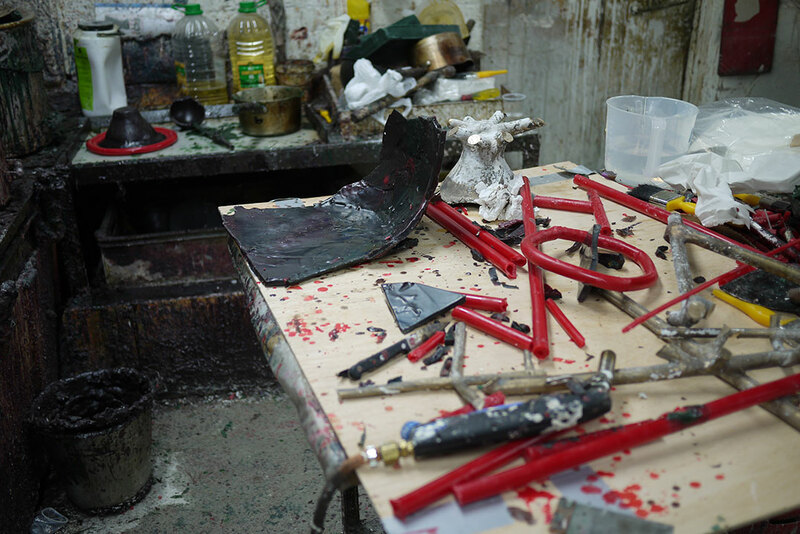 Two processes that captured my attention most were the wax spruing and ceramic shelling, both of which serve purely as a means to turn a wax pattern into bronze and are entirely removed and thus invisible once a bronze is complete. 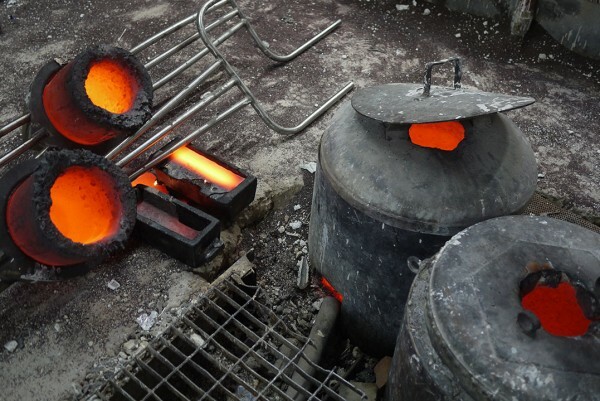 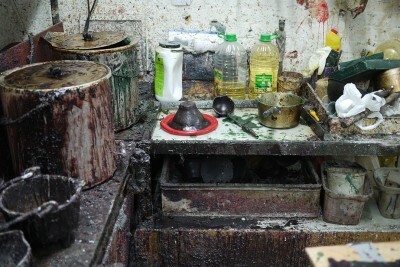 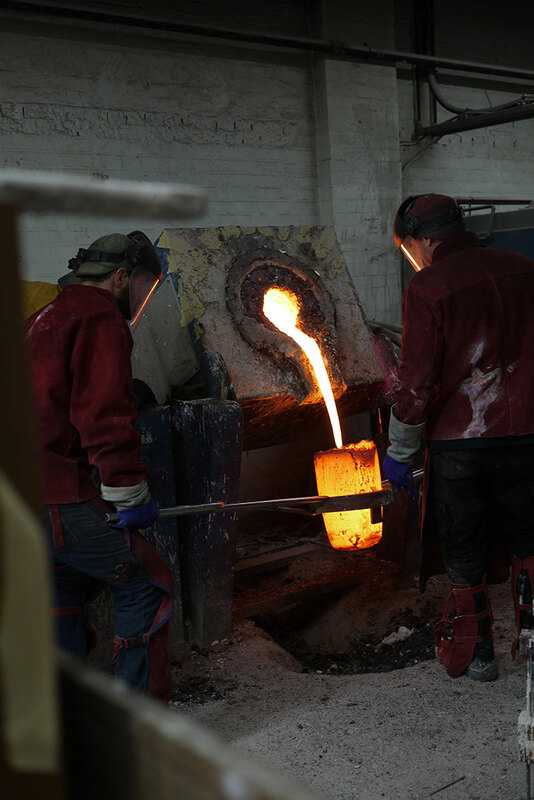 To transform a sculpture or carving into bronze the wax pattern requires a route for the molten bronze to be poured. 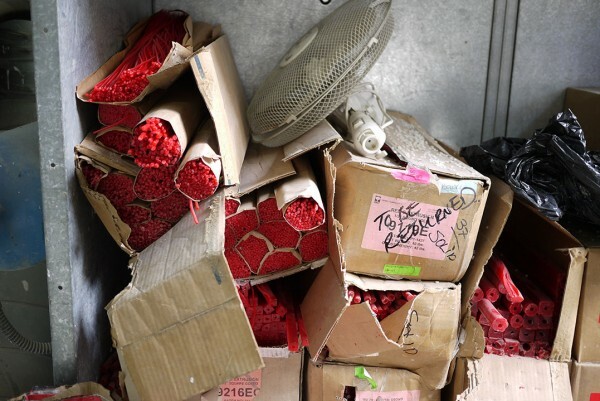 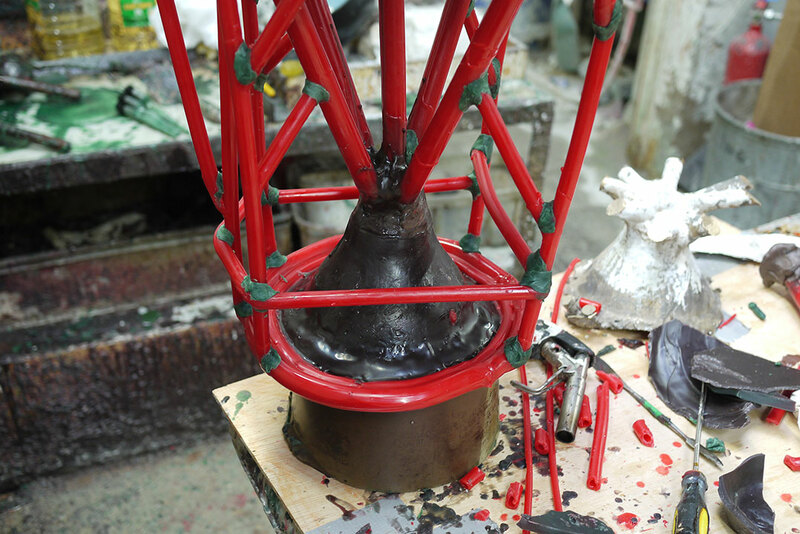 Wax sprues of varying diameters are snapped to length and melted onto the pattern in a vertical orientation according to how the bronze will be poured. 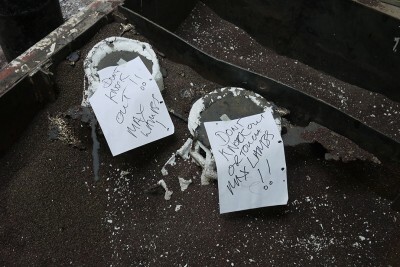 These are known as runners. 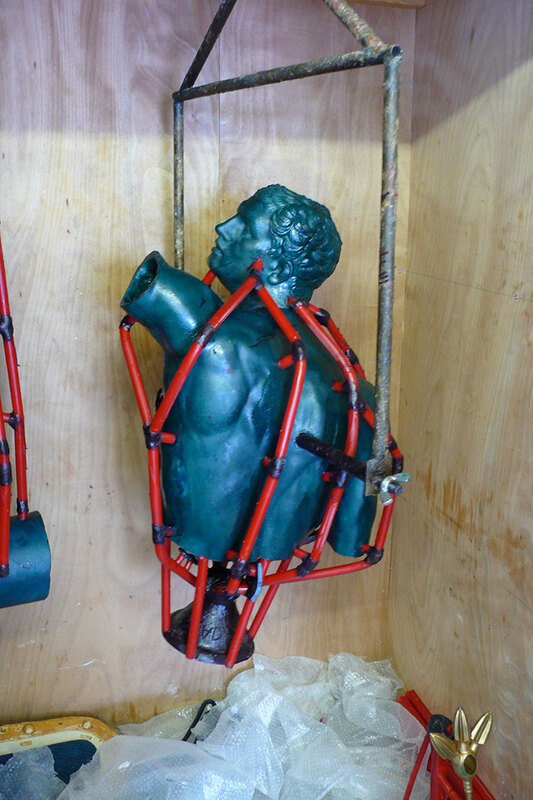 Additional sprues are attached to the extremities and lowest point of the master and return upwards. 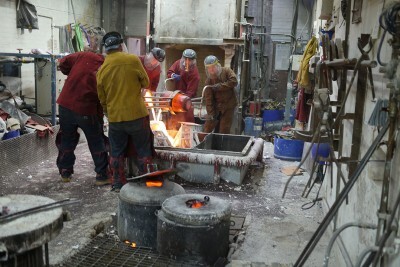 These are known as risers and allow air to escape during the bronze pour. 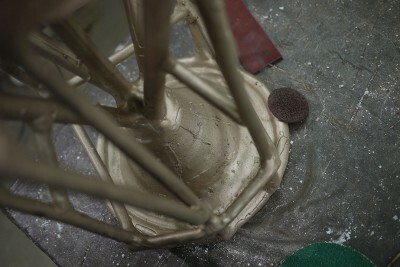 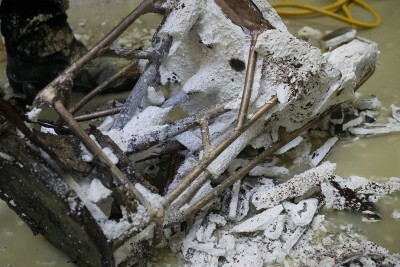 Both runners and risers meet at the top of the assembly and are joined to an inverted wax cone known as a cup into which the molten bronze is poured. 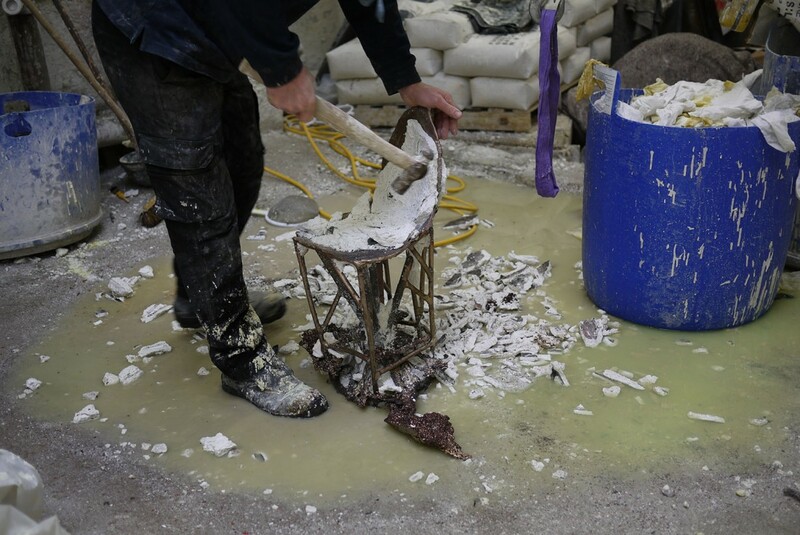 At this stage the wax is dipped or coated with a layer of liquid ceramic slurry and a dusting of silica grit known as stucco that provides a key for subsequent layers of slurry and stucco, and resists shrinkage and cracking during the de-wax firing and finally the bronze pour. 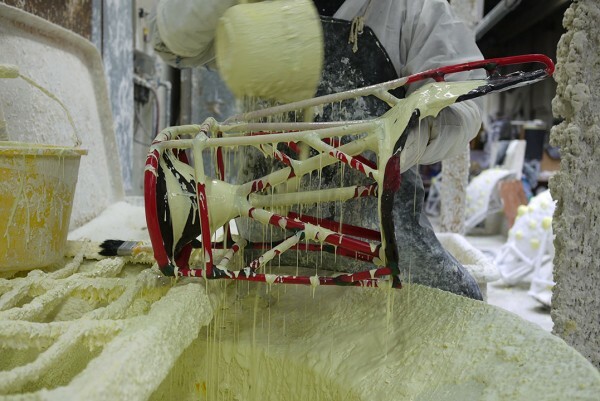 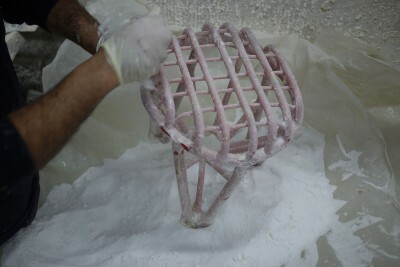 Ten to fifteen layers are applied until a thick ceramic shell has built up over the wax. 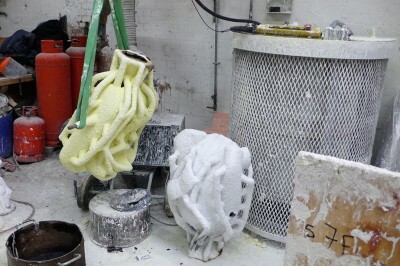 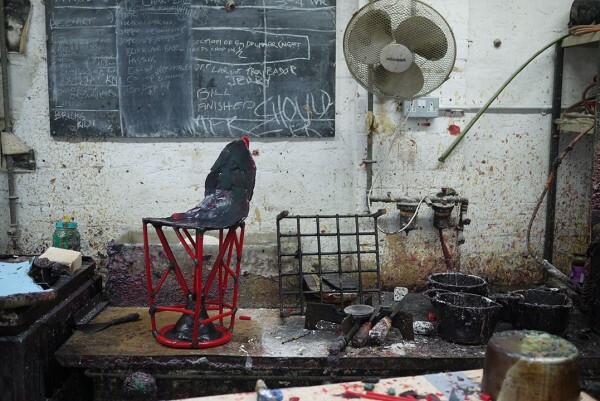 Directly inspired by my time spent in the foundry I have made two pieces of furniture which freeze the standard lost-wax casting process at two distinct stages – the first directly after the de-waxing of the ceramic shell, and the second directly after the bronze pour, also know as the investment. 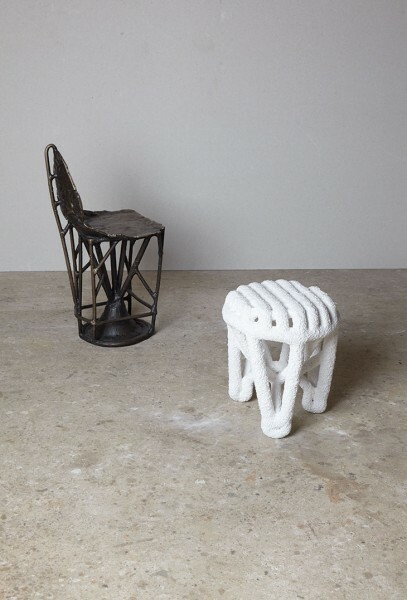 Lost Wax Bronze Chair was built entirely of wax sprues and small fragments of wax sheet which I formed into the shell of a chair. 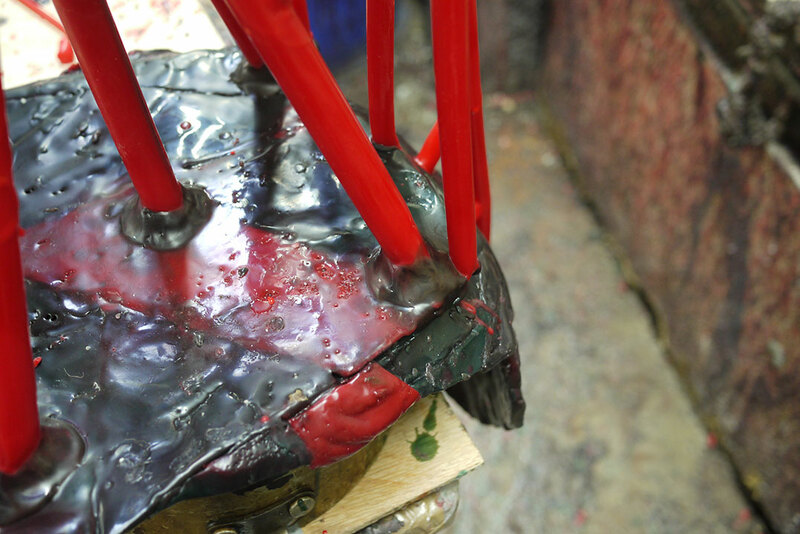 The wax shell behaved just as an artist’s wax pattern would, to which I attached the framework of wax sprues ready for casting. 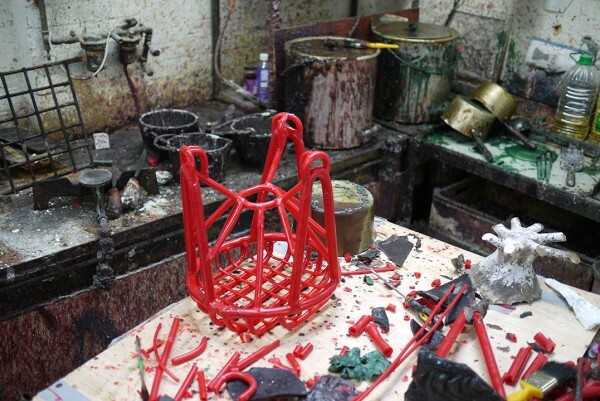 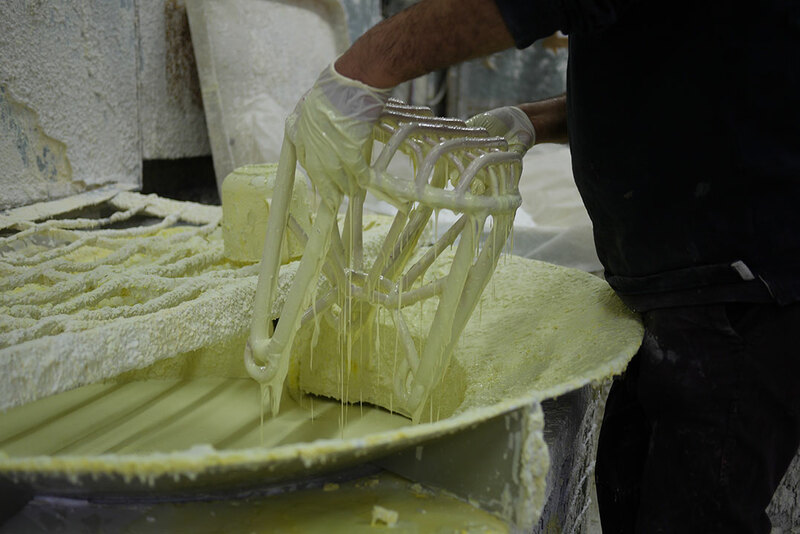 Not only did the sprues enable the wax seat and backrest to be cast in bronze but they also provided the structure for the chair’s legs. 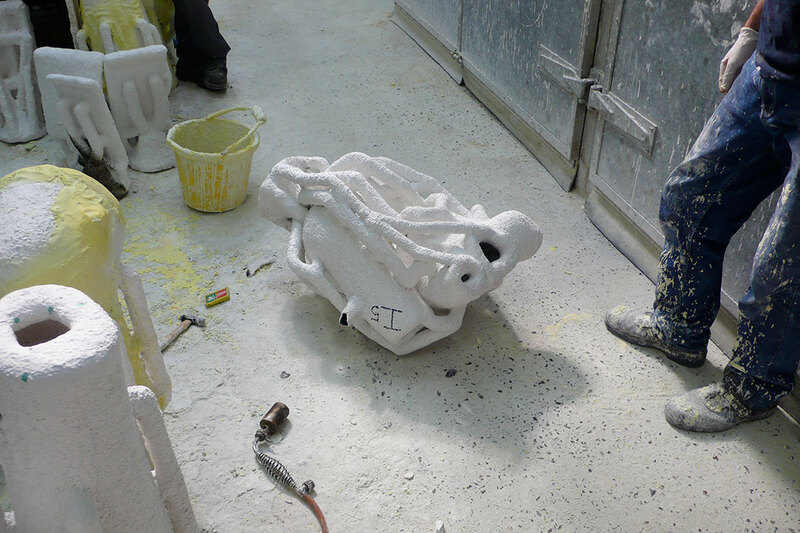 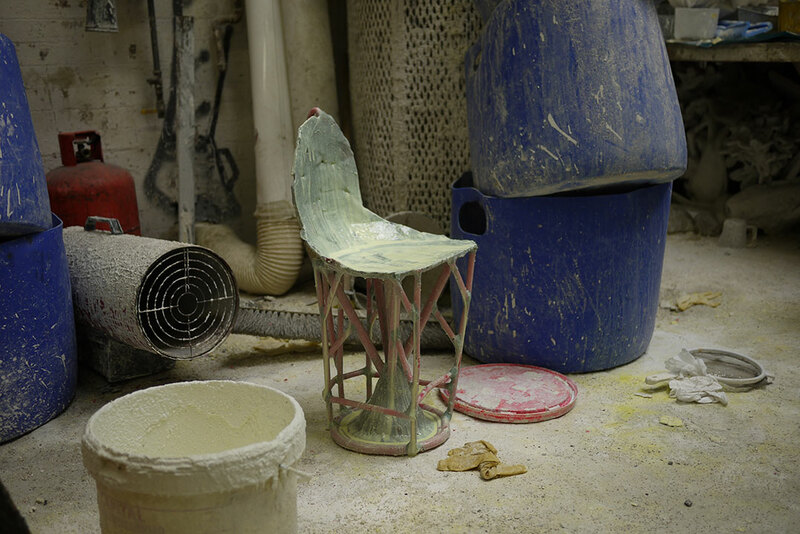 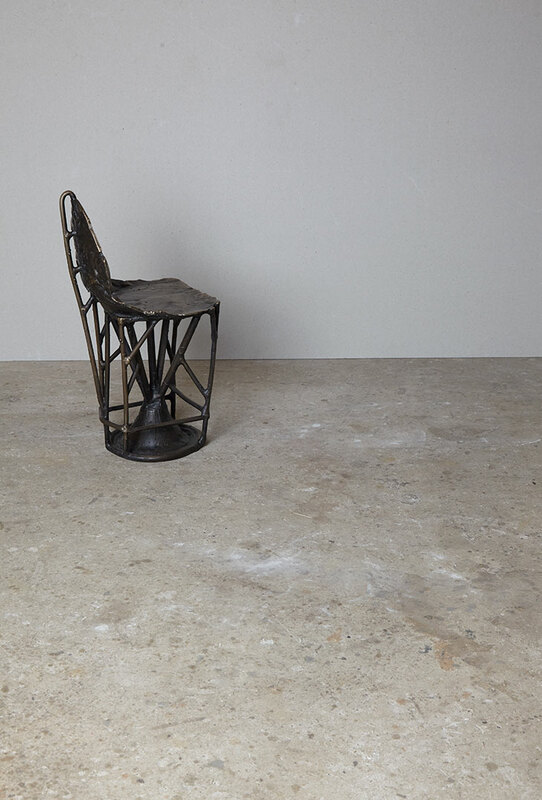 After the ceramic shell was broken from the casting minimal finishing was required before the chair was patinated and ready for use. 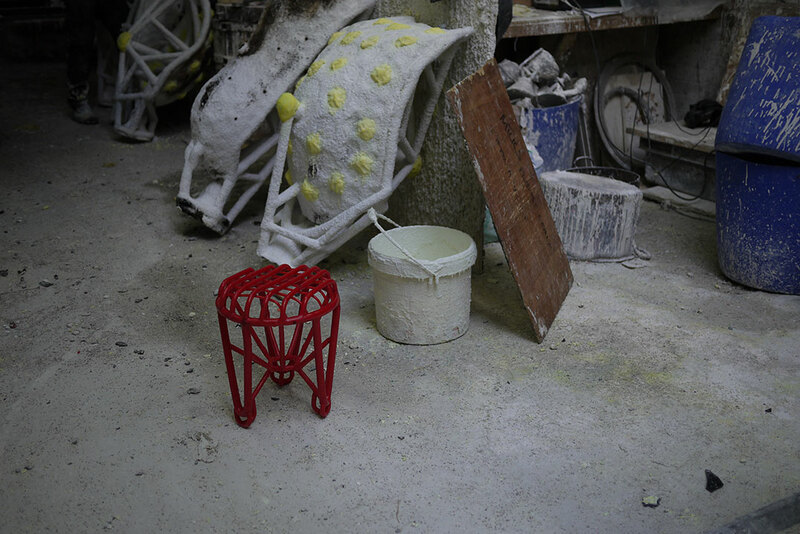 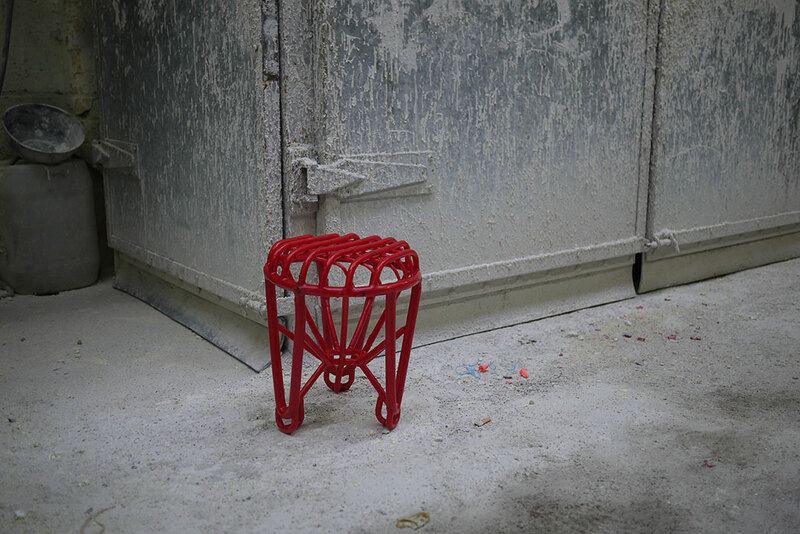 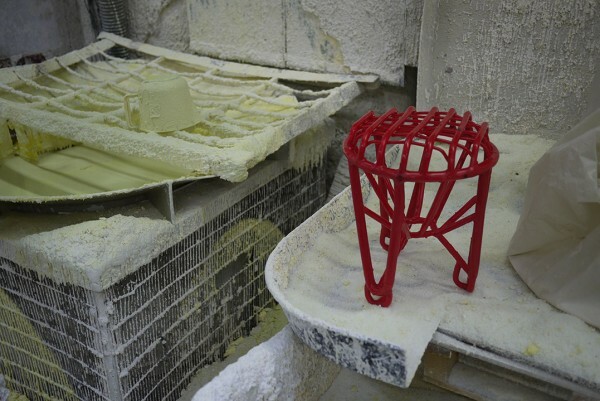 Lost Wax Ceramic Stool is made entirely of ceramic shell, a sort of reverse slip-casting where the liquid ceramic is poured over the framework of wax sprues which act as a positive mould, instead of being poured into a negative plaster mould as is typical in the slip-cast ceramic industry. 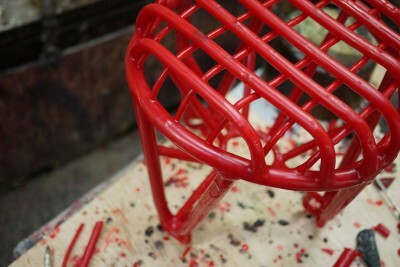 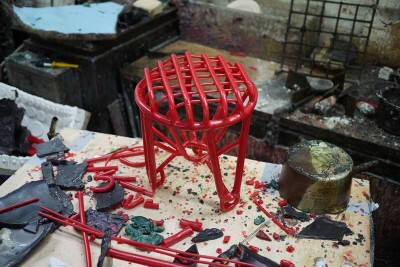 The result is an expanded coral-like ceramic stool.